Many histopathologic findings within post-stenotic kidneys are nonspecific and represent conditions associated with aging, atherosclerosis and pre-existing hypertension. 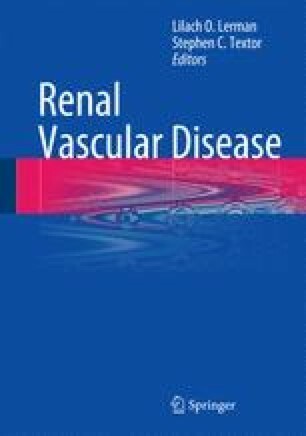 Two major abnormalities reported in patients with renovascular disease (RVD) are arteriolar nephrosclerosis and atheroembolic renal lesions. Other chronic renal “ischemia” markers include tubular atrophy, interstitial fibrosis and arteriolar sclerosis, but are less specific. Recent data demonstrate that intra-renal oxygenation in renovascular disease (RVD) is affected in a patchy way and produces local alterations that can ultimately lead to irreversible tissue damage. Moreover, kidney injury has the tendency for progressive deterioration even after the primary causal factor is eliminated. Transvenous or transjugular renal biopsy, requiring retrograde access through the venous system, was recently proposed as an alternative for patients with contraindications for percutaneous biopsy. This technique was used in a prospective study to examine histopathologic changes in biopsies from kidneys with moderate unilateral renal artery stenosis, compared with renal tissue specimens from normal kidney donors, and nephrectomy samples for total vascular occlusion. Tissue from affected kidneys has provided evidence for complex injury pathways in atherosclerotic RVD that include activation of Transforming Growth Factor-β (TGF- β) and accumulation of tissue macrophages in addition to progressive interstitial fibrosis. These data support a transition from a hemodynamic disorder to one with inflammatory and fibrotic injury that does not reverse entirely with restoration of blood flow alone. Direct examination of kidney tissue obtained by biopsy might contribute to both understand the disease process and to identify those individuals likely to benefit (or not) from measures to restore blood flow or other treatment modalities.